All our 5 bar Estate gates are made to measure (in widths of up to a maximum of 6ft / 1830mm wide each gate) in a choice of Hardwood (Meranti, Idigbo, European Oak) and Softwood (Scandinavian Redwood). Available with (or without) the elongated ‘Crooked’ hanging stile (pictured below with the ‘crooked’ hanging stile). The Estate gates pictured (in Idigbo, Hardwood) are a special and suitable for below ground automation as they feature a solid bottom rail. Crooked stile or no crooked stile? As mentioned above all our Estate gates are available with or without the elongated ‘Crook’ stile – so called because it resembles a shepherds crook staff. Both gates pictured below are, our standard Estate gates and all are available with or without the ‘Crooked’ hanging stile. Our standard specification Estate gate with the elongated ‘Crooked’ stile, shown in Meranti (Hardwood). Again our standard Estate gate but this time without the ‘Crooked’ stile, shown in Idigbo (Hardwood). 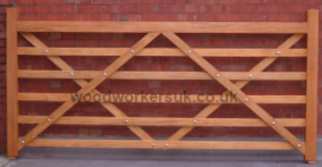 Due to their size and shape we regret that our wooden Estate gates are only available either collected from our workshops in North Wales or delivered locally to us. Rails – 2 3/4″ x 1 1/4″ / 70mm x 30mmManufactured in five smooth planed, even smoother sanded timbers! 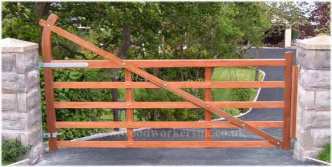 If you require delivery please enter your location.Please note: Our Estate gates are available either collected from our workshops in North Wales or delivered locally only. Do you intend to automate your Estate gates? Please include height and widths of gates required.